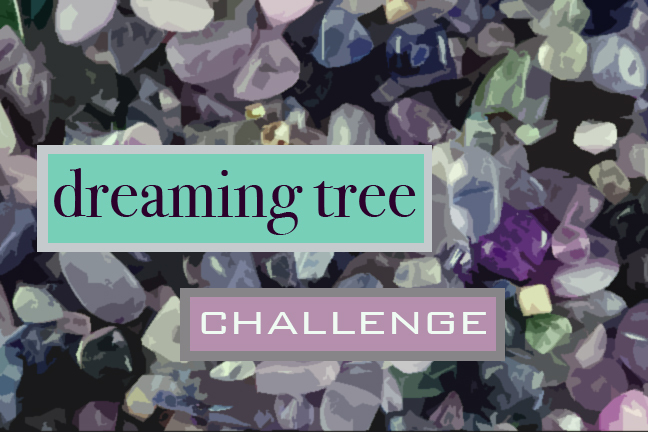 I'm so pleased to present the latest challenge reveal! Today we're unveiling our creations made for the Dreaming Tree Challenge. Before we get rolling, I wanted to express my gratitude to everyone who purchased a kit! Thank you! It's really exciting to see what people make. These lovely projects encourage us to keep doing what we're doing! 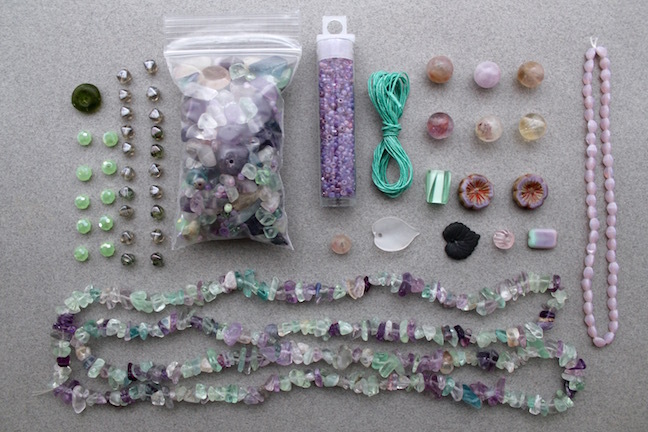 The color palette for this challenge started off being inspired by a few pieces of rainbow fluorite. It's an airy mix of sea foam green, pale purples, and icy clear. There's even subtle touches of gold and gray. It reminded me of the shifting colors of the aurora borealis. To read more about the inspiration, CLICK HERE. Each of the kits also included a Mystery Component! It's a surprise piece made by me. I forgot to reveal it this past month, so here it is! It's polymer clay and depicts and tree with star blossoms. I'm really drawn to this image, of a tree twinkling with starlight. Nancy Noyes-Ward made these pieces. 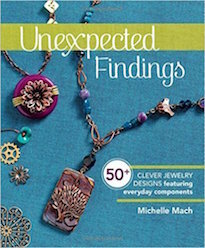 Here's what she had to say about them: "I love Andrew's pendant and the luxe bead mix was swoon-worthy! I worked up a prayer lariat in honor of my sister. It was a very cathartic piece to make. I saw the hibiscus beads and knew immediately that I wanted to use points with them to highlight the orange in the bead and the exact color of the hibiscus tree gift from my children. I am on the road and don't have the ear-wires I would like to use with these, but will add them when I return home. I have so many more earrings in mind! Thank you for a great challenge!" Laurel Ross made these pieces. Here's what she had to say about them: "This challenge was sort of threefold for me. The waxed linen was a mistake. A BIG one! Instead of trimming it into the 2 meter lengths that are sold in the store, I trimmed an entire spool into 1 meter pieces. Whoops! So I had a lot of linen to play with. Here's another funny fact... I can't stand the feeling of it on my hands. So Challenge #1 – Use up the linen. My first piece was for the Pretty Palettes Challenge for July. I used 24 strands of linen and the inspiration was the Aurora Borealis. The star button closure is from Green Girl Studios." "My other personal challenge (#2) was to get over my distaste for stones in chip form. Andrew had gotten in these beauties and as a tribute to my aunt, whose mantra was "if you like it, buy it in every color", I bought every strand of fluorite in the shop. 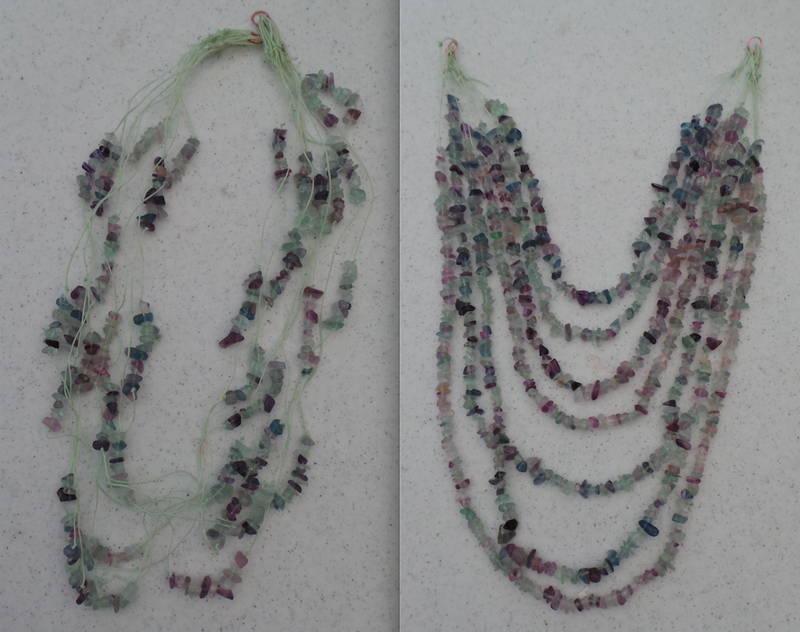 Needless to say, after all the rest ringing and knotting, I only have two full strands of the original twelve left. My last challenge was to get this done in time! And I just barely made it. Once I determine how to finish the ends, I will have a pretty awesome fluorite collection to wear!" These pieces were made by Cheryl Lee Tucker. 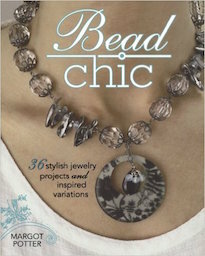 Here's what she had to say about them: "I made a necklace and earring set using some lavender pearls with the nuggets. The lavender color is a subtle compliment to the cool green shades of the stones. 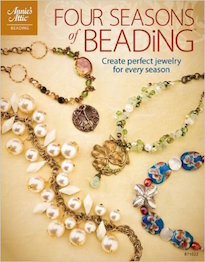 I like the smooth sheen of the pearls offset by the earthy, chunky nuggets." Cheryl Lee Tucker also made these pieces. Here's what she had to say about them: "For the wrap bracelet/necklace and matching earrings, I followed that same mixed up texture path. 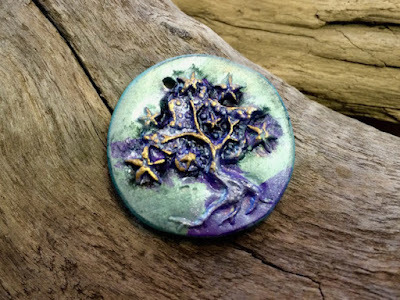 I had the stones in my collection and used the lovely Dreaming Tree component as a focal. The nubbly linen cord shows through and around the polished stones. I used gold findings to highlight and the gold branches of the Mystery Component. Hope you all like them!" Dawn Berkebile made these pieces. Here's what she had to say about them: "So I chose this for my first challenge because of the color combination. It reminded me of the quilt squares I made with my mother while she was still alive. The set is shown with a couple of the squares. That was my inspiration." Melissa Wynne made these pieces. 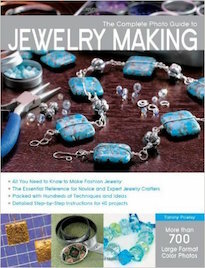 Here's what she had to say about them: "I loved the colors and the great selection of beads. It's so soothing to sort them out. It's easy to get lost in the colors and textures. 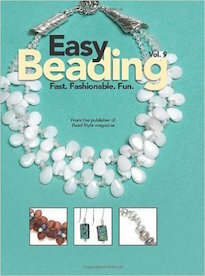 I used to work almost exclusively with seed beads and delicas, but due to my older eyes, I've gotten away from them. The glass flower beads I selected for earrings "wanted" me to try to them again and it was nice to find out that I could still work with the tiny beads. The stones for the necklace were challenging to string, but to my surprise, I was able to work with them too! The wrap bracelet can be worn as a necklace. 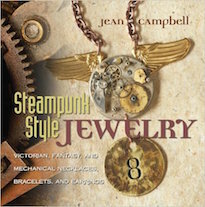 I used a magnetic clasp to make it a snap to put on and take off." These pieces were made by Valerie Tilghman. 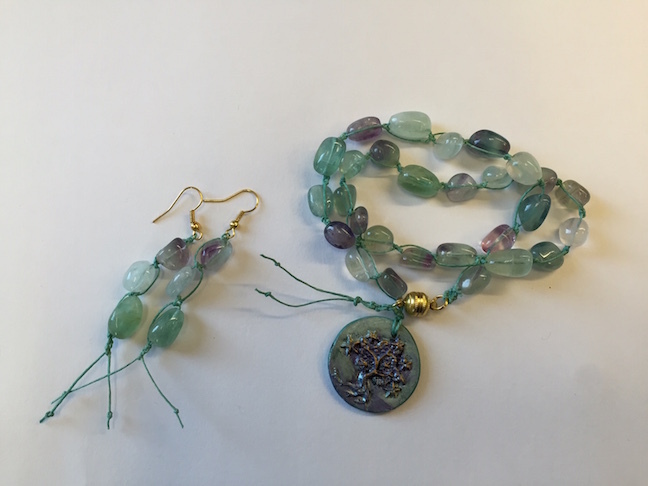 Here's what she had to say about them: "I love fluorite! It's a soft stone but has such an amazing display of color. Such a wonderful gift from Mother Earth! 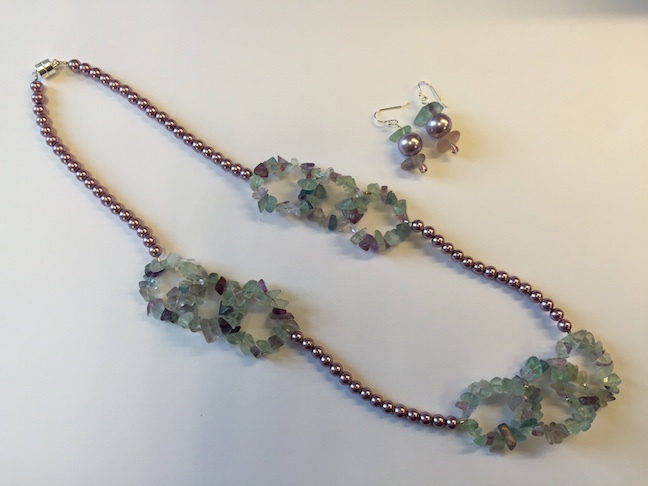 Being that it is such a soft stone, using fluorite in a necklace lowers the risk of damage to the stone and allows everyone to see up close how beautiful they are. I used the lovely artwork made with the loving hands of Andrew as a focal for a bracelet. Being able to see it on the wrist will always remind us of how strong we are as a tree and all of the twists and turns that life brings are the branches. Last, but not least, the earrings! The center beads with the burst of color just screamed earrings! Paired with the lavender and hematite accents I look forward to wearing my favorite colors." 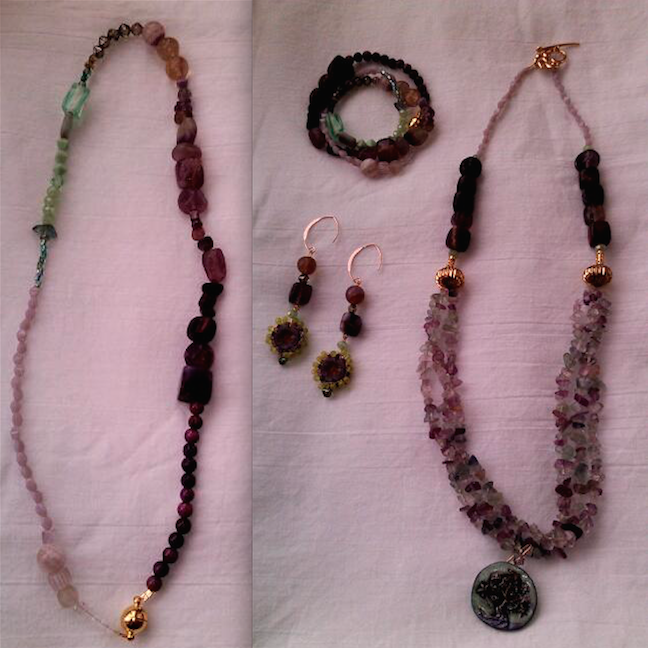 These pieces were made of Donna Hoblit of VeraDonna Treasures. Here's what she had to say about them: "The set on the left are my favorite style of jewelry with a bit of whimsy in the earrings. The pieces feature lampwork by Jill Symons and Julie Burgard. The fine pewter Grow Strong tree is from Green Girl Studios. The set on the right pushed me out of my comfort zone. 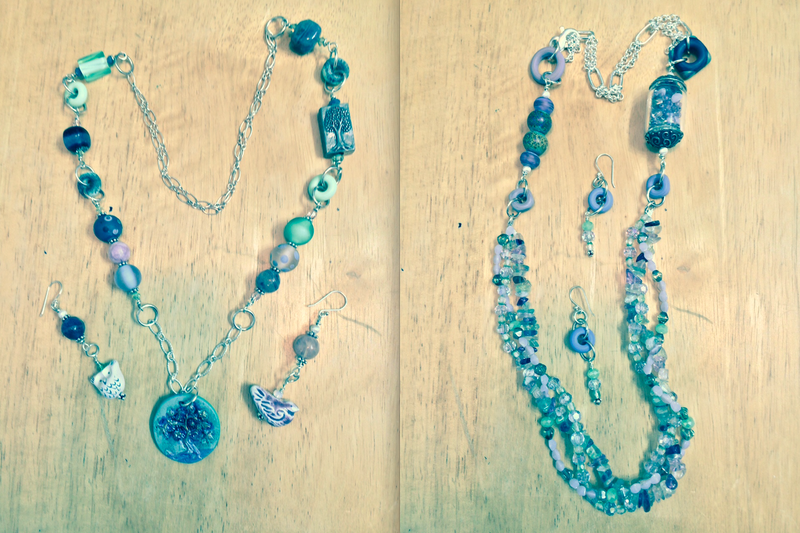 I used smaller beads and with the lampwork glass by Julie Burgard and the glass bauble capsule by Green Girl Studios. I put the smallest of the beads in the capsule." This ring was made by me! I've been on a kick making rings and after playing around with the components didn't want to stop! So I found a way to work them into a ring. Since I made this ring for the Dreaming Tree challenge, I didn't want to have a plain band. So I twisted, hammered and soldered wire together and created a band that's supposed to be stylized roots. You might be wondering how I worked beads from the kit into the ring. It's simple! I smashed them! I made a mold of a stone, mixed the pulverized fluorite bits with resin. Once it was cured, I dyed the resin with alcohol inks to make it look more like a solid piece of fluorite. Once that was ready, I bezel set it. But wait... there's more! Check out what these participants made for the Dreaming Tree Challenge! Make sure to hop around and comment on all the amazing creations! Everyone did such a wonderful job! 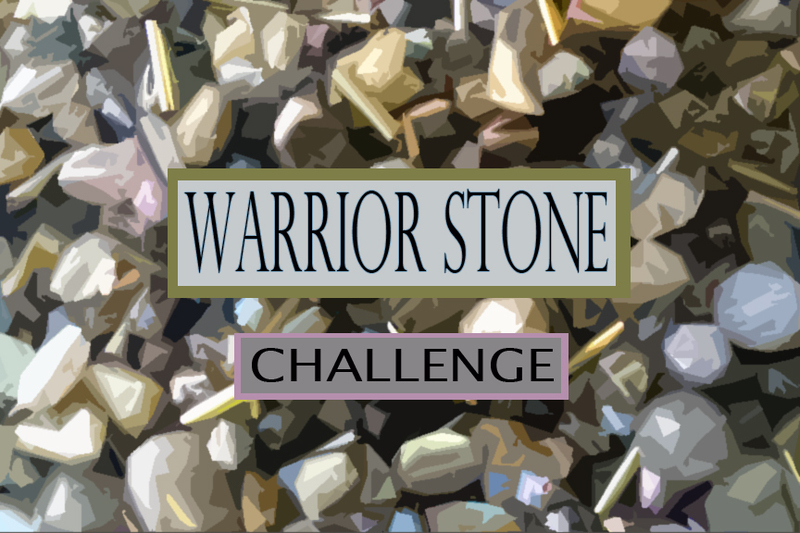 Up next is the Warrior Stone Challenge! I hope you'll swing by and see what everyone made for it! The reveal date is scheduled for Thursday, September 10th. The next kit goes on SALE TOMORROW! The new kit is called, Brave Angel. It's a Special Challenge and is breast cancer awareness-themed. Everyone 's work is beautiful and unique which is fun to see since the kits are the same. What great designs! I would be proud to own and wear any of them. I also loved to see that we had some newcomers to the group. I love Nancy's lariat necklace. I always want to make one and never have. I love the use of the leaf on the end. I LOVE the black wire with the earrings; it really brings out the color in the beads. Lovely. I absolutely love Laurel's aurora borealis necklace. Perfect! I love waxed linen, but I will admit to washing my hands semi-freqently when using it to get the sticky off! 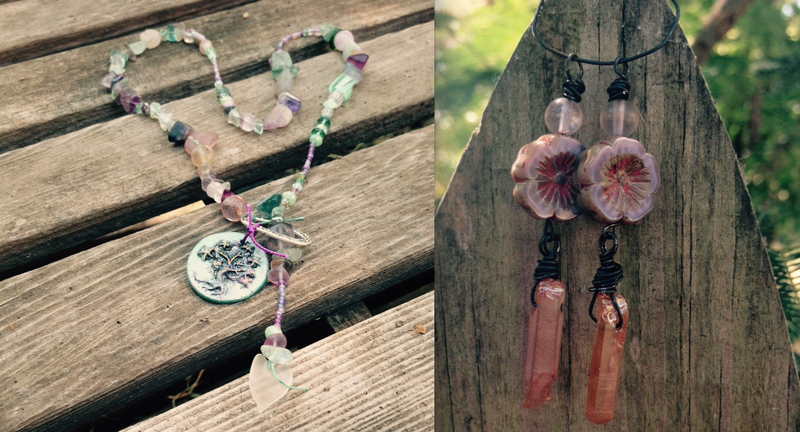 I love the lush look of the other necklaces just bursting with fluorite. People have such wonderful, creative shapes this time. Great design in Cheryl's necklace with the loops. I also really like the idea of a convertible piece! Dawn really went to town with so many lovely pieces! Great job, and I hope to see you in more challenges now that you've dipped your foot in. I love the addition of some darker colors in Melissa's creations as well as the gold. I also love sorting through beads and find it very relaxing. All of Valerie's pieces are so fun and different. My favorite just have to be those fringy earrings!! What great style and movement. 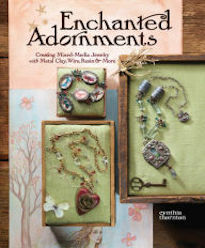 I really appreciate the special touches in Donna's pieces like the Green Girl bauble jar (I'll have to check that out!) and the different birds for the fun earrings and the Green Girl tree bead in the necklace. Andrew's ring is amazing! Not only is it beautiful, but I love how the meaning was brought in with the twisted band. But what I love most is the creative use of the kit beads! Wonderful. Thank you for another wonderful, fun and creative time with a design kit! Nancy: Your lariat necklace is so pretty and I love the Lucite flower dangle. I wanted to make a lariat for the upcoming challenge but time is ticking away! I also love your flower earrings. I really enjoyed playing with these pressed glass flowers. Very pretty! Laurel: Wow! I love the multi-strand necklaces and the fact that you really pushed your personal boundaries diving into the challenge! 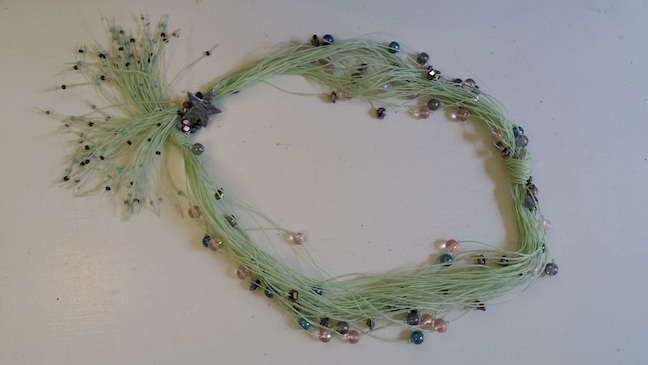 The Aurora Borealis necklace is stunning and I love the closure and sparsely strung beads. It really does capture the wispy nature of this beautiful, celestial phenomenon. Great job!! Cheryl: I love the way you linked the chip components together on your necklace and the pearls definitely soften the look of the design and give it a pretty luster. The versatility of the wrap bracelet/necklace is a fabulous idea! Dawn: You translated your quilt inspiration into your design challenge beautifully! The jewelry sets showcase the floral aspect of the color scheme perfectly. Melissa: Another versatile wrap bracelet/necklace! I love your dense, multi-strand necklace. And I'm glad you found working with the seed beads was a pleasurable experience. Great job on a beautiful set of jewelry. Valerie: Beautiful wirework designs, one and all!! The earrings are so pretty and I love how you framed them. 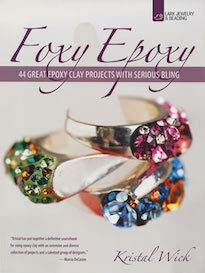 The bracelet is gorgeous and is the perfect way to highlight Andrew's poly clay focal piece. The statement necklace is so pretty and I like the way you attached to the wire work. Donna: I love your whimsical style! The necklace using the tree of life focal is fun and eye-catching and the earrings pull together the garden theme perfectly. The multi-strand necklace is loads of fun also. The capsule filled with beads is great touch! Andrew: OMG! That is the most clever idea to use the smashed bits to create a composite stone. I would love to take a class to learn this technique! 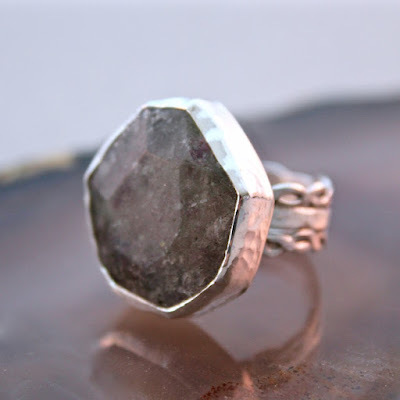 I love rings and this one is a one-of-a-kind masterpiece! !